When whelping puppies, it is very important to be prepared. This means having what you need on hand. 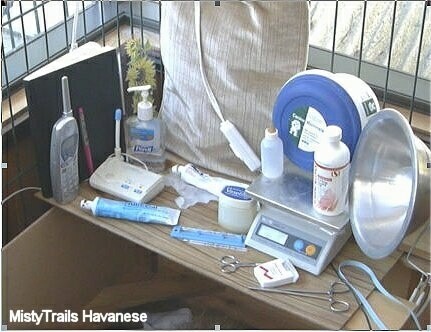 Here are some supplies and tips you should consider, courtesy of MistyTrails Havanese. Have your vet on call, and phone number handy. Have your vehicle filled with gas. If needed, have a babysitter on call. Ideally you will have a friend on call to assist you, and drive to the vet with you if needed, or to help with children or anything else that may arise. 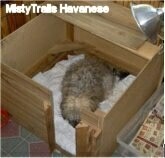 The design of this box works perfect for pups from 0 to 3 weeks to keep them contained. Sometimes you have to move the opening against a wall to keep them in as they grow. By 3 weeks simply TURN the box over (upside down) so the raised entrance becomes a doorway to the potty area. Notebook with numbers and pages for recording dam’s progress, puppy weights, etc., pen, telephone, baby monitor, hand sanitizer, NutriCal, K-Y jelly and rubber gloves, heating pad, Vaseline and thermometer, scale , Mamalac and bottle, alcohol, scissors, floss and hemostats, ribbon, heat lamp.